It all started in the lab. Dr. Gustavo MacIntosh, a molecular biologist at Iowa State University, was investigating how soybean aphid feeding affects soybean plant gene expression and metabolism. It all started in the lab. Dr. Gustavo MacIntosh, a molecular biologist at Iowa State University, was investigating how soybean aphid feeding affects soybean plant gene expression and metabolism. One particular change he noted was an increase in the concentration of linolenic acid in soybean leaves in response to the aphid. “We know that linolenic acid is an important part of the plant defence response,” says MacIntosh. So he wondered whether soybean varieties that are bred to produce seeds with low levels of linolenic acid might be more susceptible to soybean aphids than conventional varieties. Figure 1: In the plant, linolenic acid is synthesized from oleic acid and may be used to synthesize compounds involved in plant defence against insect attack. 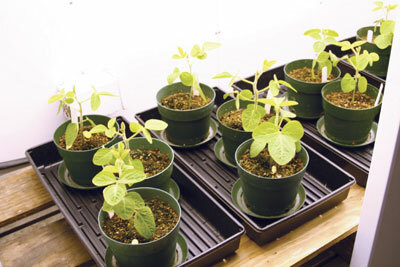 O’Neal is concerned about potential implications for soybean production. He says if the hypothesis is supported, it may mean that recommendations for the production of low-linolenic soybeans need to be altered. Growers may need to use different management tactics against pests when they produce low-linolenic varieties than when they produce conventional varieties. Therefore, one goal of the project is to determine management recommendations for low-linolenic soybeans. Scientists ask whether altered fatty acid levels in the seed affect a soybean plant’s response to various pests. The experiment began in 2008 and will encompass three growing seasons. “In Iowa in 2008, we had a very wet spring and early summer, so our first year was challenged by having to replant some of the plots because the experiment was drowned,” says O’Neal. In fact, according to the 2008 Annual Climate Review: US Summary, prepared by the US National Climatic Data Center, Iowa had its 11th coolest year, and eighth and seventh wettest spring and summer, respectively, since the start of the 20th century, and was plagued by flooding. Unfortunately, this meant that the researchers were not able to get soybean cyst nematode and brown stem rot to establish that first year. However, they did manage to collect data from the aphid treatments. “What we’ve seen in the preliminary data from 2008 is that low-linolenic varieties were no more susceptible to aphids than the conventional varieties, which is good news,” says O’Neal. “We didn’t see differences in aphid populations or yield among the low-linolenic and conventional varieties.” He cautions that more data from additional years are needed to look for clear trends. MacIntosh’s task is to analyze the composition of leaf and seed tissue from the field experiment. “I am just analyzing the first year of data, so I don’t have a lot of information on the composition yet,” he says. He notes that the expression of the linolenic acid trait is complex because a number of factors can affect the concentration of linolenic acid in the plant. These include insects, temperature and moisture, all of which could interact. Understanding the biochemistry and molecular biology of the low-linolenic trait can help in predicting its effect on plant defence. To synthesize linolenic acid, enzymes in the plant convert oleic acid to linoleic acid and then to linolenic acid (Figure 1). Under insect attack, specific plant defence systems are activated, converting linolenic acid to green leaf volatile compounds and/or jasmonic acid via a number of steps. Green leaf volatiles attract predators of the insect herbivore, whereas jasmonic acid signals the plant to produce compounds that are toxic to the insect. 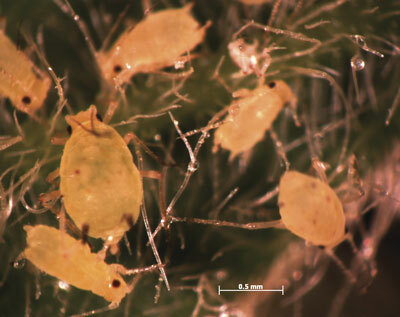 compounds involved in plant defence, increases in soybean leaves in response to aphid feeding. The effects of the low-linolenic trait on plant defence could differ among low-linolenic soybean varieties, depending on which step of the biochemical pathway is altered to get the low levels of linolenic acid, says MacIntosh. For example, if low-linolenic acid is achieved by a mutation in the plant that increases the conversion of linolenic acid to one of the plant defence compounds, then the insect resistance could be unchanged or increased compared to a conventional variety. However, if low linolenic acid is achieved by a mutation that blocks one or both of the conversion steps from oleic acid to linolenic acid, which is the case in at least two documented mutants, the resistance could be reduced. 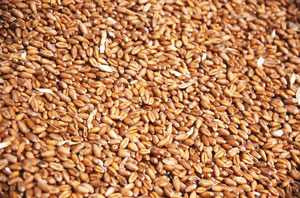 So, if there is an effect of the low-linolenic trait, it may only manifest in response to certain pests. “We do have some reports from farmers that the aphids sometimes seem to prefer the low-linolenic varieties,” notes MacIntosh. These observations have not yet been validated. Further experiments are required to test whether aphids really do choose low-linolenic varieties over conventional varieties when both are available. Indeed, ensuring the suitability of management recommendations may become even more critical as additional specialty traits such as high oleic acid and high omega-3 fatty acid are rolled out for soybeans.